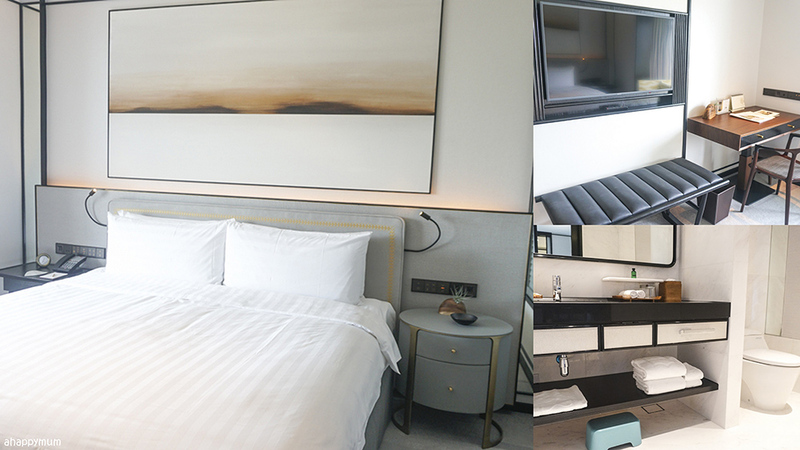 On our first family staycation at Shangri-La Hotel, while we did enjoy the opulent room, posh surroundings, exquisite high tea and delectable food, we left this luxurious hotel feeling that it wasn't the most kid-friendly one in town. No doubt we loved the pool and the lush gardens, but it still seemed like there was a lack of facilities designed with the little ones in mind and if I had to pick a family-friendly hotel to recommend to my friends, this likely wouldn't have been it. Well, guess how much has changed within the short span of less than two years? We were stoked to hear that Shangri-La Hotel has become the first hotel on Orchard Road to design and build an interactive play space for children, catering to both hotel guests and the public. Yes, Buds by Shangri-La officially opened at the start of this year and the kids and I were very much looking forward to exploring it for the first time. It was a wish came true when we made the staycation happen on my birthday weekend and the best part was that the hubby managed to join us at the last minute so we could enjoy some family bonding time, which was the only thing I would have wanted. Here's sharing with you all about Buds by Shangri-La and for those of you who are keen to check it out too, I am giving away passes at the end of the post, so read on! In addition to providing family-friendly restaurant menus and extensive childcare amenities, Shangri-La has gone all out to create a new, exciting experience for families - the 9th floor of the hotel's newly revamped Tower Wing is now dedicated to family travellers and comes complete with five brand new Family Themed Suites and 19 Deluxe Family Rooms. Occupying a space of 72sqm, each family themed suite includes two bedrooms and two bathrooms and kids can enjoy their own tunnel access between adjoining parent’s room. The five themes are namely Castle, Space, Underwater, Safari and Treetop. Each suite can also be connected to a Family Deluxe Room to provide for larger families. See how awesome the Castle Suite looks? Yes, it would definitely feel like a dream to stay here some day! We did hear that these are very popular with the hotel guests even though one night's stay can cost around S$1k. Yes, that also means we didn't get to stay in a themed suite because they are so high in demand, which was a pity for the kids as I know they would have gone crazy over it. Nonetheless, we were treated to the comfort of two connecting Family Deluxe Rooms which I will show you more below. The Deluxe Family Room offers 38sqm of luxury and you can choose to have twin beds or a double bed in the room. What delighted us most was the window alcove which can be converted from a kids’ play area to a decent sized bed for the younger ones. In fact, I think two of my kids could fit there easily so our family of five would be comfortable just staying in one room. It was a heartwarming gesture to see that there were three cute bears neatly laid out beside three kid-sized poncho towels on the alcove, and they had even set it up as a bed for us prior to our arrival. In fact, everything felt so cosy that we just snuggled together in the alcove to watch TV, snack and play card games. You wouldn't believe it but eventually, we didn't even go out for our meals at all but instead settled for in-room dining so that we could idle around, do what we like to do and simply enjoy our private time together in the room. Talking about in-room dining, there is a wide range of options for you to choose from, including western, international, asian and local delights. Prices are not cheap but still generally affordable as compared to the high-end or fine dining restaurants. For both our lunch and dinner, we didn't have to wait for more than half an hour so I thought the staff was really efficient. The service was also excellent as we had our food laid out neatly and swiftly on a room service table, plus they were also quick to clear everything after our meal too. As for the taste wise, it wasn't the best but we still gave it a pass. The hubby was not impressed by the Chicken Rice and found the meat too tough but I did enjoy my Laksa, which even came with a lobster claw, to the very last mouthful. 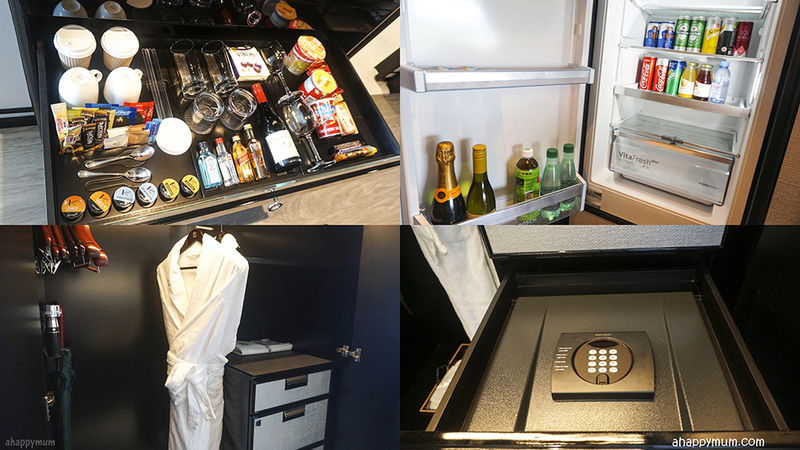 Coming back to the room amenities, each Deluxe Family Room comes with an adjustable desk that is suitable for both adults and kids, a minibar counter, a large refrigerator which even comes with a freezer, and more than enough storage space for the whole family. Even though there wasn't a bathtub, the kids still loved playing with their water toys in the shower area and it was convenient for us that we could keep an eye on them from the room. See how these windows could slide open from the outside? Yes, that means no privacy at all. Haha. But it also means the hubby and I could try to catch some snippets from a movie while the kids bathed and played together. We were totally surprised to find three sets of brand new toothbrushes, a brand new toothpaste and three plastic cups all arranged neatly inside the toilet. It was amazing that the hotel staff had even bothered to get toothbrushes that were personalised according to the ages of my three kids, how thoughtful, right? There was also a set of Mustela cleansing gel and body lotion available for the kids to use too, in addition to a stepping stool and an alligator-shaped anti-slip mat inside the toilet. Such attention to details goes a long way in making our stay a pleasant one and we greatly appreciated this sweet gesture from Shangri-La, which we rarely encountered in other hotels. In knowing that it was my actual birthday, I was also treated to a delicious cheesecake after dinner and we held an intimate cake ceremony right in our own room. See? It must be the first time I blew out candles and made a birthday wish while being clad in a bathrobe. Haha. Much thanks to Life's Tiny Miracles who also sent me a birthday cheesecake and guess what, we finished every bit of both of these yummy cakes the next day! In understanding the needs of families with young kids, all guests on the 9th floor can also enjoy access to a shared pantry which provides a washing machine, dryer, iron, induction heater, microwave and hot/cold filtered water dispenser. What impressed me was when I saw the extensive range of amenities that guests can request for during their stay - these include baby diapers, baby monitors, thermometers, sterilisers, board games, travel cots, strollers, bouncers, car seats and Stokke products such as the Sleepi cot, babycarrier, bathtub and high chairs too. Now for the highlight of our stay! I was half expecting Buds by Shangri-La to be like any other ordinary playground. It turned out that things exceeded my expectations and we ended up enjoying ourselves more than I thought we would. 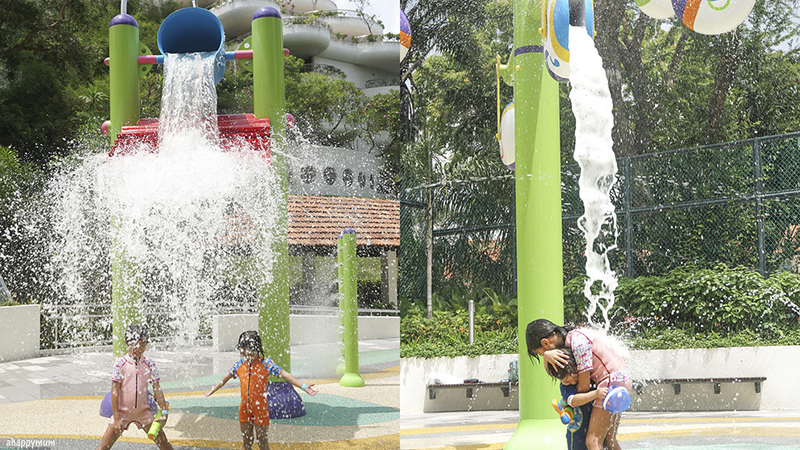 The kids fell in love with all the facilities within the playground and to make things more exciting, there was also a range of fun-filled activities which they could choose to participate in too. I'll share more about the activities later on, for now, let's go on a tour inside the playground! Occupying a vast space of over 2,150sqm in total - 850sqm indoors and 1,300sqm outdoors, Buds by Shangri-La is an immersive play space that lets children learn through play in a creative, self directed and experiential environment. Guests can look forward to embarking on a journey of discovery through four key aspects: embracing nature, adventure, camaraderie and independence. The indoor play area is a welcoming space and the first thing that greeted us was this giant ball pit filled with lots of blue and white balls. It wasn't deep enough to cover up the girls when they laid down but still deep enough to let them have fun jumping in over and over again. In the middle of the pit stands this towering net structure that allows the kids to climb up to a second tier which is made of a netted mesh. As one might expect, adults are not allowed on the nets no matter how lightweight you may be. The staff is pretty strict about this rule so do note that the kids need to be big enough to climb up and play on their own. If you have a toddler like I do, you will not be able to climb up together with him if he wants to go up and play. Hooray for elder siblings? Haha. I never thought that nets can make good slides too but apparently, this one does and the girls loved it! If you haven't heard of it yet, cassia seeds playgrounds are all the rage in recent years. These seeds look dark brown like soil, are coarser than sand grains yet fine enough such that they run through your fingers easily. The cassia seeds section in Buds is one of our favourite highlights and the kids spent a good amount of time here scooping, shoveling and letting the seeds fall down over and over again using the plastic toys provided. We were told that the seeds are organic, non-toxic and will not pose any harm even if accidentally swallowed - that makes a safe and reassuring play environment for our little ones. You will see the cleaners having to sweep and clean up the surrounding area every once in a while and don't be surprised if you end up finding seeds in your pockets when you go back to your room too! I was totally awed by the wall backdrop which consists of a calming scenery with a cascading waterfall, tall mountains and three-dimensional trees. It was really quite therapeutic just hanging out here with the kids, I must say. I asked the kids where they loved most about the indoor playground. Angel's favourite was climbing over the rope obstacles, going down the tall slides and swinging on the big balls. She was also intrigued by this learning corner on the second tier (these pics are taken by her!) where you can learn about planets and their characteristics. As for Ariel, her ultimate favourite was the curved trampoline but she also enjoyed going down the fireman's pole and climbing up the rock wall using a rope. As for the two-year-old Asher, his favourite was this ball play area at the opposite end of the playground which comes with ball blasters for the kids to aim and shoot foam balls into the 'windows'. It can be tricky trying to differentiate the blue foam balls from the plastic ones (which won't fit into the blasters) but all that fun he had definitely made the effort worthwhile. For parents of toddlers, you will be glad to hear that this is a separate play space specially designed for our little ones. They can go on kiddy car rides, have fun on the gentle slides, step onto the floor piano, play with soft blocks and watch balls float in the air by pressing a button. Moving onto the activities, you can check out the activity schedule for the day itself when you register at the reception counter and receive your wristband. The schedule shows the timings, locations and activities you can sign your child up for. Note that there are limited slots for every session and registration is on a first-come-first-served basis. Some of the activities come at an additional cost on top of the entrance fees so do check with the counter before you sign up. Stage is a music studio for the young performers and it comes with a piano, drums, cymbals, costumes and wigs, a DJ console, a computer where you can play some of your favourite pop hits and a huge screen for you to watch the music videos and groove along to the beat. Even if you don't sign up for the Jigglybuds activity that takes place here, you can still come into the room whenever it is available and have a good time making your own music. Kids can unleash their imagination at Muddy, which is a creative space designated for the budding artists. They will be able to join in a storytelling session first before creating a piece of artwork themed to that storybook. For Ariel, she used recycled materials to create one of her favourite book characters - the Gruffalo. We heard that in some of the art sessions, kids get to paint fluorescent paint onto the walls and make their own graffiti too - which sounds really fun! With the help of the hotel's chefs. kids will be able to take part in an interactive hands-on baking class at Bake where they will learn simple baking techniques such as mixing, folding, moulding and decorating and make their own bake treats. I have to say the cookies Angel did were so delicious that we were sad when we finished all of it! Parents can enjoy a moment's peace, have a quick bite or enjoy a cuppa at Recharge cafe which is located just behind the reception counter. For those who wish to host a birthday party for your kid at Buds, you can choose from the basic or premium package and select one of the three themes - Super Star, Wild World and Royal Fiesta. For more information on the party packages, go here. There is a washroom located within the premises so you don't have to go in and out, which can really be a hassle in some other playgrounds. Oh, and just so you know, the entrance to the playground right after the reception is guarded at all times by the staff. Any kid who wishes to go in and out will need one of the staff to tap their wristbands before the door can be unlocked, so that minimises any worry of the kids running out and getting lost. The toilet also comes with rubber slippers for the guests to use and has a diaper changing station too. 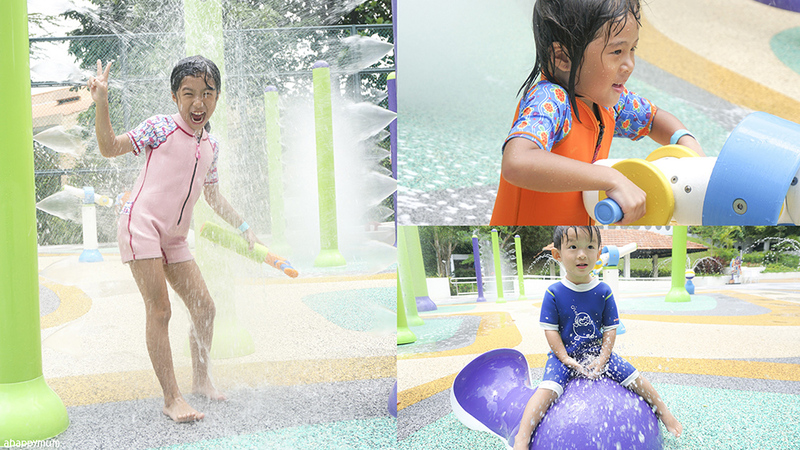 For those who would like to enjoy the sun and splash around in water, Buds by Shangri-La offers an outdoor play area just behind the Garden Wing too! It is a walking distance away from the indoor playground and you will have to cut across the pool and walk along a path before you can get here. Still, since the fees paid include access to both the indoor and outdoor areas, you should definitely make a trip here before leaving. The outdoor play space consists of two parts - the first is the dry section which has a giant pirate ship structure complete with climbing nets, spiral slides and rock walls. Kids can take part in the Treasure Hunt activity (check the activity schedule for the timings beforehand) where they have to hunt for the missing parts of Captain Hook which are hidden all over the playground and stick them back in place. The second part is the wet section which we really enjoyed! It might be a small water play area and comes with the usual tipping buckets, water guns, slide and a small river for the kids to play with but thanks to great weather and no crowd, we spent an entire morning here before we checked out. By the way, these kid-sized poncho towels came in really handy and one size could fit all three of them, haha. I guess for us, what determines our happiness most is whether the family is together. The kids were happy to play with each other and it was a heartwarming sight seeing how the sisters would protect the brother from getting sprayed in the face. For me, I will always remember how the kids squealed with joy when the five of us were under the tipping bucket (see it in our video clip) and the water came gushing down on us together. That is definitely a precious, lasting memory for us. Thanks to Buds by Shangri-La for the wonderful family weekend, the kids absolutely had a blast and we hope to be back for more fun-filled afternoons soon! To find out more about Buds by Shangri-La, you can visit www.rediscovernew.shangri-la.com/discover/about-buds/. More information about the location, opening hours and a list of FAQs can also be found. For the ticket pricing, please see below. 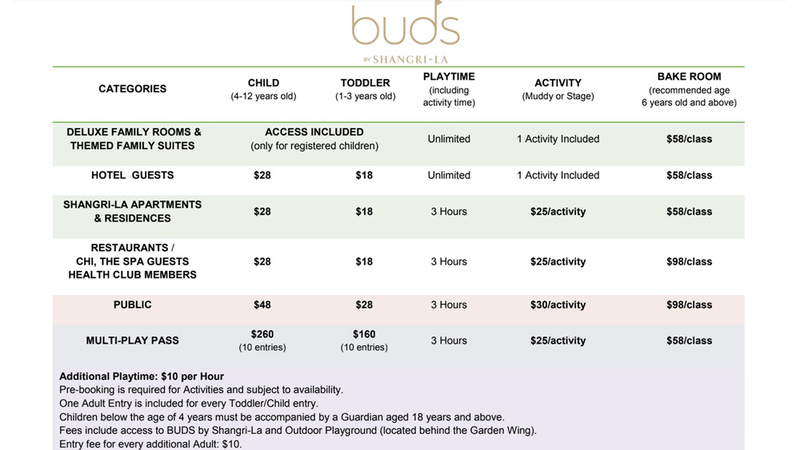 Good news, I am giving away two passes to Buds by Shangri-La (worth $48 each) so that you may experience all the fun in this new playground too! Each pass admits ONE ADULT and ONE CHILD, includes three hours of playtime but excludes the activities which come at additional cost. Two winners will be randomly picked in this giveaway. Admission is subject to availability and other terms and conditions set by Shangri-La. To participate in this giveaway, watch the video above and leave a comment in this blog post with your name, email address and what you love most about Buds by Shangri-La. Indicate below that you have done so and to increase your chances of winning, you can choose to carry out the rest of the options. This giveaway is by no means sponsored, endorsed or administered by, or associated with Facebook or Instagram. Best of luck, people! Disclosure: We were invited for a 2D1N family stay by Shangri-La which includes all activities at Buds. All opinions are my own. After reading your post, I was so tempted to book a staycation at shangri-la immediately! What I love most about BUds are the wide range of kids play stuff! Imagine both Outdoor and indoor play area in a hotel! It’s suitable for small toddlers and also great for elder kids. I have a 3yo and a 7yo kid...I am sure both will have a blast there! Cassia seed playground of Buds by Shangri-La will be the ultimate rage for my 5 year old son and 2 year old daughter! I love the spaciousness and the cleanliness of BUDS. The different theme of the playground definitely will leave me girl screaming for more and not willing to leave. I especially love the stage theme as my girl enjoys to be in the limelight be it singing or dancing. It is an awesome place for playdate where the mothers can sit around for some good dining and chit chatting while the children have fun. The cassia playground is ultimate heaven for my two little ones. The stage theme is super awesome and I bet my daughter will absolutely love Buds!!! Love the spaciousness of Buds and the Cassia Seed Play area. My 4YO will definitely love it. Love the variety in the indoor playground, and not forgetting having an outdoor waterplay area within the same premise! It’s going to be the best combi for an child. This is definitely a place where all children wants to be, and i believe my toddler will definitely enjoy herself at the cassia sand and toddler zone. If she is old enough to be independent, I bet she’ll love the netted zone too! It's looks like an awesome place to soak up plentiful of fun for kids of all ages. I'm sure my kids will love the wide variety of indoor n outdoor activities in vast space given! The net zone will be a bonus for the little explorers. Love the spacious playground and the different activities the kids can partake in. As I have 3 kids of different ages and needs, the different areas for toddlers and older kids ensures that there’s something fun for everyone! It’s hard to choose a favorite, i must say! My little girl who is 4yo would definetely love the Stage as she is a total performer. I myself would enjoy it too. She is an active little gal and i’m betting a whole day play indoor and outdoor wouldn’t be enough for her she’ll be screaming to come back for more. Oh wait! There’s a whole lot of activities which will probably take half a day. I feel like booking for 3 days. Lols. As for my little boy, Toddler crawl with me is a haven to drain his all his energy and then mom will BF him in the relaxing nursing room. I must say, i love everything! Thanks for the review, it’s so detailed i can imagine myself having fun already. Haha! 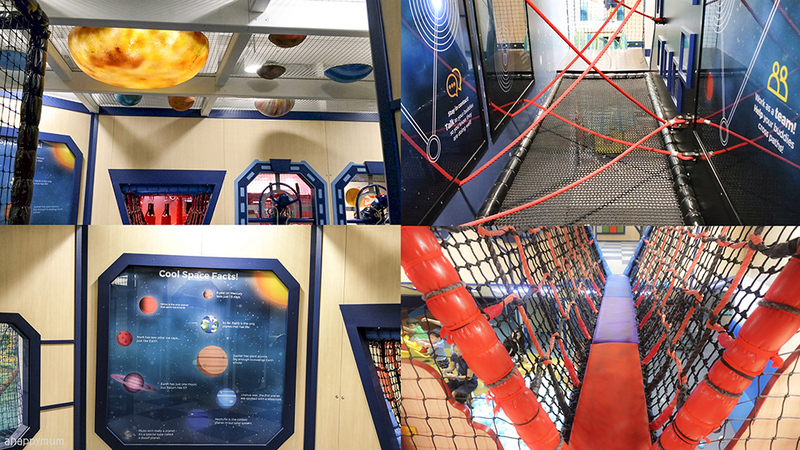 I love buds because it has a very huge play area and caters to a Wide range of age group! I love the awesome nets and climbing area. Hope to win as my kids love indoor playgrounds. And this looks so fun. My kids had not been to playground with cassia seeds. 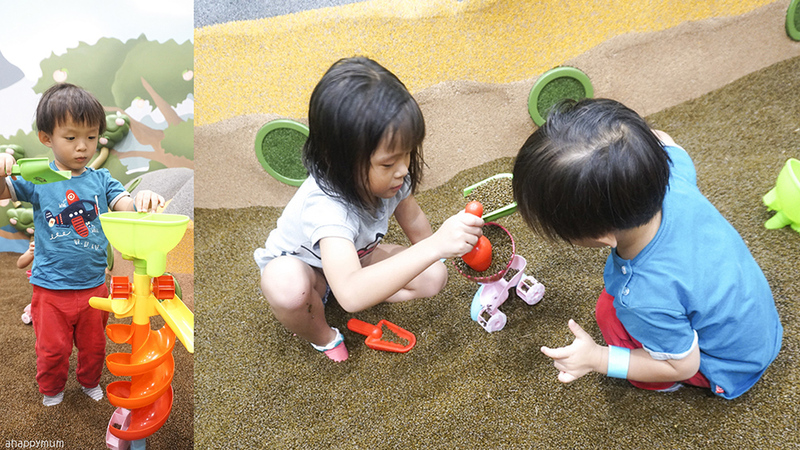 Hope to win the chance to explore the playground at Shangri-la. 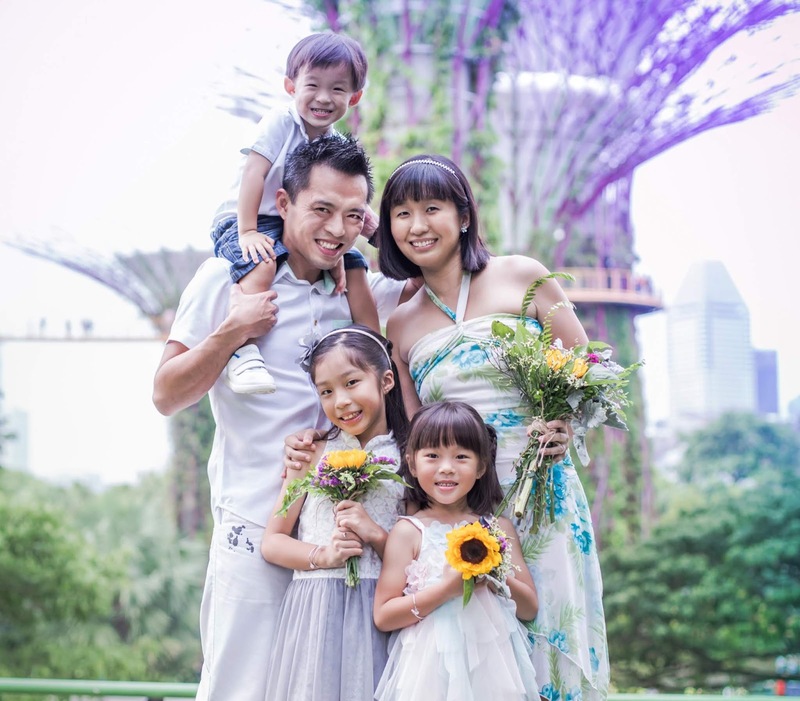 Thanks to Shangri-la, Singapore to have so many interesting activities for children and family! My gals love the rock climbing the most! Our last staycation, only access to Horizon Club! this is simply Super and see u al soon! Thanks for the giveaway!Had been wanting to bring my children to Buds!I like their vast playarea with different sections for toddlers and older children. Most playgrounds are either indoor, or outdoor. Having both indoor and outdoor playground with a wet area under 1 entrance ticket, my children would love it to the max! I love Buds as it allows the kids to explore on their own and learn to overcome certain obstacles along the way as adults are not allowed to climb up. I like it that there are various sections for the kids as their attention span is short. When the kids are tired, they can just hop into the cassia seeds playground to rest before running up the slides again. Indoor Outdoor they have it all! Both my kiddos will have a ball! So much to do and explore! so hope to win & shout & roar! I love the variety of activities @ buds and after watching the video, i’m So tempted to book a staycation @ Shangri-La. I love the wide range of activities available in Buds. Definitely doesn’t look like you can cover all of it in just one visit! My boy will love the toddler zone. Full of balls and he love slides. I Love the spaciousness and cleanliness of Buds. My girls will love the toddler zone and the outdoor activity. It looks very spacious and it has many interesting activities for the girls to explore around. Much thoughtfulness was done to create a safe and fun playing environment for the kids at BUDS. I love that there is a zone dedicated to toddlers, as well as play areas suited for older kids. With four kids from 1yr old to 9yr old, Buds can cater to all my four kids at the same time! 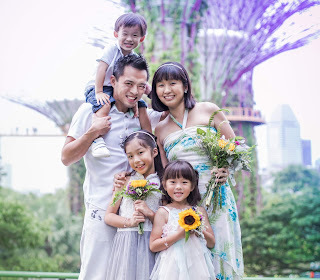 Our children are HUGE fans of the Toots Club in Rasa Sentosa, Shangri-La's sister resort on Sentosa, and we have staycayed there a few times already because it is so family-friendly. But BUDS takes it many many notches higher, with extensive indoor and outdoor play zones, and scheduled activities that come with instruction. They will love MUDDY, BAKE, as well the huge playscape with cassia seeds and ball pit and nets, plus the cool outdoor play area. My boy will love the toddler zone. Full of balls and he love slides. I Love the spaciousness and cleanliness of Buds. Thank you for the Awesome Giveaway. My 18mths old girl would love the waterplay and cassia seed areas! Buds looked so bright, clean and inviting to the kids. Hope to bring her there. I love that it have so many fun activities for children to join! How many hours of fun did u set aside to play both indoor & outdoor playground? E indoor playground alone looks rather big! Wonder if my 3yo can play both indoor & outdoor in 1 afternoon (assuming she skips her nap). I love the sheer variety of activities! There's something to delight every kid for sure! Love the wide variety of activities that will bring joy and fun to my kids. They will be so thrilled to win this as part of their bday gift that is coming up soon . April and May is our family's month of birthdays and I have been looking for ideas to celebrate. It have to cater to the young ones as well as the head of the family. Happened to chance upon this post while doing my research onine. Looks like I found the answer. This place will let my kids have a blast while the hubby and I celebrate in a cozy corner. Best of both world! The indoor play area is so so so awesome, my daughter got so excited just by looking at the video or photos by seeing what it has to offer. There are so many different types of play area/options that it would keep the kids busy through-out. Three hours is probably not enought for my daughter. I cannot imagine how much fun she would have in there. I am sure she is gonna love the Stage area too because she always loves singing and dancing, putting on a performance for me at home all the time. Thanks so much for the very informative review! As a first-time mum, I'm always looking for fun places to bring my boy to, and Buds by Shangri-la ticks all the boxes. In fact, I think I might be even more excited than my boy at the thought of visiting the place! Lol.